Thank you to Shelley Ellison, Shelquin Labradors, for the opportunity to own this boy out of her very special girl, JanLon Creek's California Gurl WC CGC ("Katy") bred to one of my all-time favorite dogs, BIS MBISS GCH CH Rancho's Il Commendatore ("Enzo"). Katy and Enzo exhibit so many of the wonderful qualities in both type and temperament that I value and strive to promote in the Labrador Retriever breed, so I'm very excited to see what the future holds for their sweet, lovely puppy. 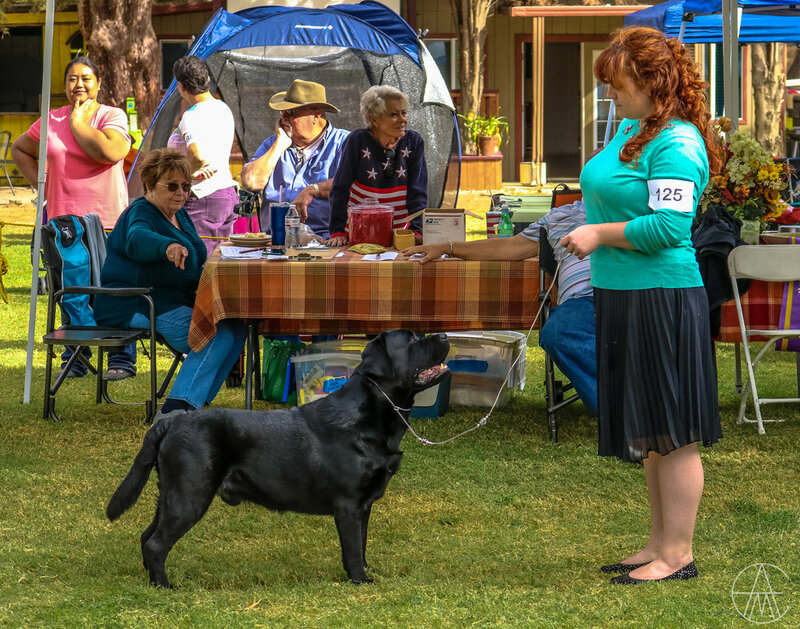 Khan, a few days shy of 19 months, in the ring at High Desert Labrador Retriever Club with his handler, Michelle Jace. Acton, California, November 11, 2017. Photo courtesy of Adam Murphy. 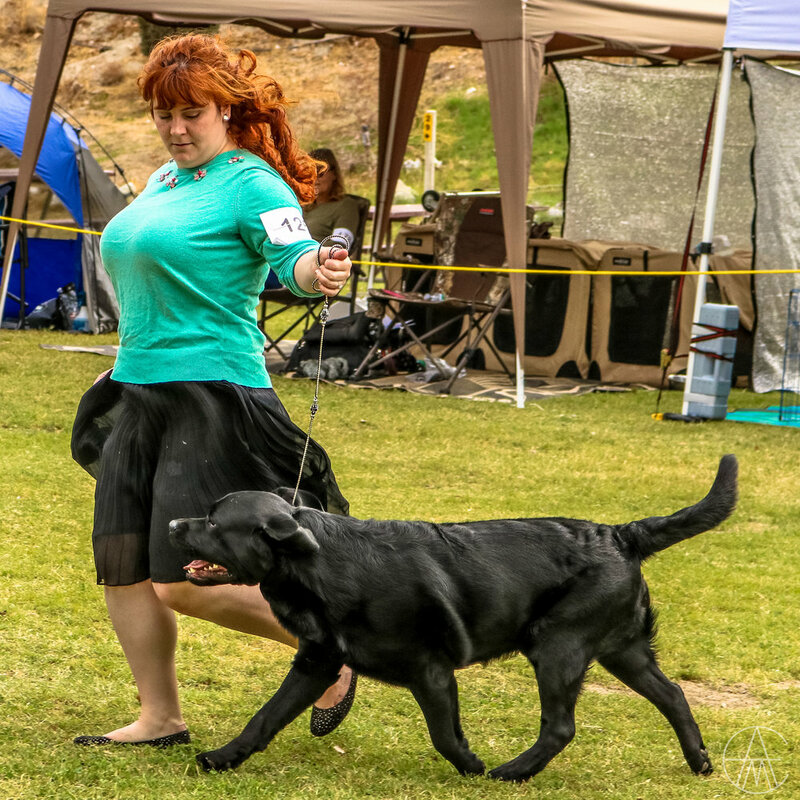 Khan on the move in American Bred Dog on day 1 of the 2017 High Desert Labrador Retriever Club specialty with his handler, Michelle Jace. Photo courtesy of Adam Murphy. One day shy of 6 months of age. Taken at the 2016 Labrador Retriever Club National Specialty in Chino, CA. Courtesy of Photography of Dianne Mullikin. Slideshow photos above courtesy of Photography of Dianne Mullikin. Khan at 12 weeks of age. Khan at 8 weeks old. Khan's dam shown above. All photos of Katy courtesy of Shelley Ellison. To see photos of Khan's sire, Enzo, please visit our friends at Rancho Labradors. Khan passed his puppy eye exam at 8 weeks, and all other existing clearances were conducted by DDC Veterinary. See Khan's page in the database of the Orthopedic Foundation For Animals. Copyright © 2015-2017 Daos Boonma. Please do not copy or download photos or text without written permission. All Rights Reserved.